It shouldn’t come as any surprise Kyle Busch’s best opportunity to pick up NASCAR win No. 200 will be in an Xfinity Series race. 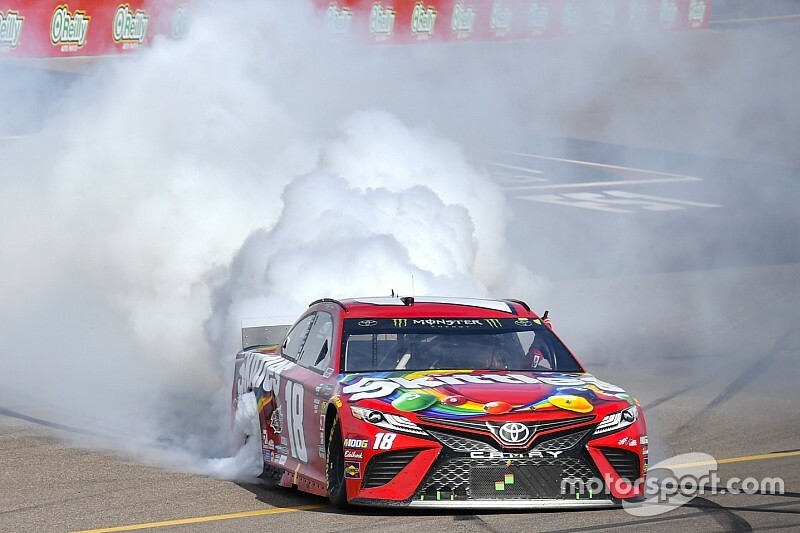 After all, of his 199 wins across NASCAR’s three national series – Cup, Xfinity and Trucks – 94 have come in what is now called the Xfinity Series. His 94 career wins are 45 more than next-best, Mark Martin (49 wins). Busch’s winning percentage is actually higher in Trucks (he’s won 53 times in 147 career starts), but 347 series starts ranked second to Cup (502). In addition, Busch leads all drivers with six Xfinity wins at Auto Club Speedway, including three from the pole. Though he hasn’t visited Victory Lane in his last three series starts at the track, he has led laps and battled for the win and finished no worse than third. In total, Busch has 18 series starts at the track, six wins, 12 top-five and 15 top-10 finishes. He’s won both of the Xfinity races he’s entered so far this weekend (Las Vegas and Phoenix). “Anytime we show up at the track we have a pretty strong chance to win. The Joe Gibbs Racing Xfinity Series program has been very impressive for the last few years and I know what these guys are capable of putting together each week,” Busch said. “At a track like Auto Club – that’s worn and has seen a lot of racing – sometimes we’re just racing the track and having to make sure we’re set up to be there at the end. Regardless if he reaches the win Saturday, there will still be a chance on Sunday. Busch is fresh off his first Cup Series win of the season last weekend at Phoenix and has three Cup victories at Auto Club, with the most recent coming in 2014. He started second and finished third in this race one year ago. Like seven-time Cup champion, Jimmie Johnson, Busch also earned his first Cup series win at Auto Club Speedway. Asked last weekend about assessing his chances of reaching win No. 200 in California, Busch said: “I’d assess it as pretty good, I guess. It would certainly be nice to get it done on the West Coast swing, but it’s not a necessity. “It will happen when it happens, and you can’t push too hard and do stupid things or make mistakes in order to think too much about that number. You just have to let the race kind of play out and let it come to you and we’ll see where we are at.